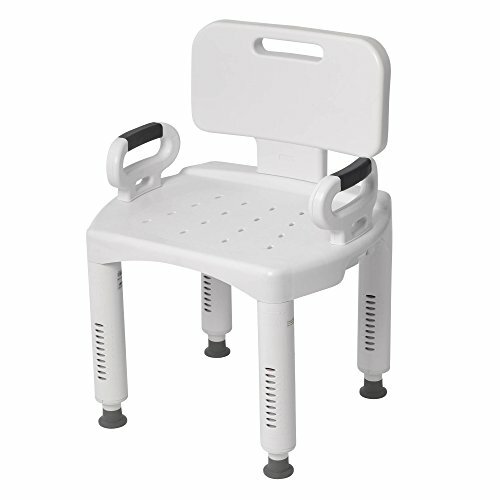 Shower chairs are a type of shower aid designed to guarantee a safe bathing experience. Shower chairs are engineered to easily adapt to a variety of different sizes and shapes. They are typically light weight, with wide and stable legs, which also have rubber non-slip feet. These security and stability features make sure that the shower chair is maximally safe for users of different heights, weights and medical impairments. Another convenience of shower chairs is that they are easy to assemble and to disassemble, most often without the use of tools. Let’s take a look at some of our favorite shower chairs. 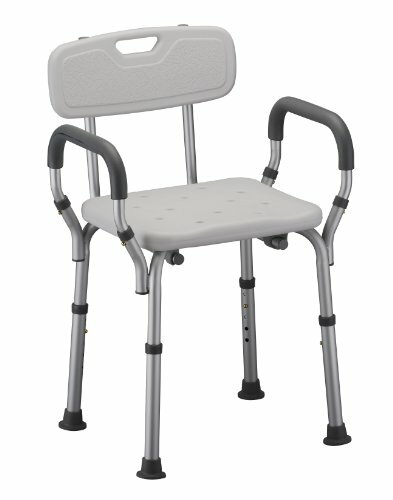 This Drive Medical shower chair is designed to fit all user shapes and sizes. The height can be easily adjusted by one-half inch increments from 16 to 20.5 inches. The seat dimensions measure 16.5 inches deep by 21.75 inches wide, respectively. It can support a person weighing 350 pounds or less. 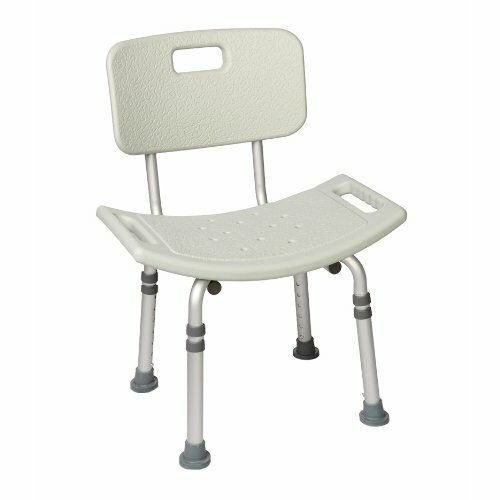 This lightweight and portable chair is great for people who need assistance with mobility and balance while taking a bath. It comes with non-slip feet that ensure stability at all times. A broad majority of the Nova Bath Seat’s users report being satisfied with their shower aid due to its solid feature set. It is durable, safe and comfortable to use on account of its backrest and padded arms. It sits on a strong and lightweight aluminum frame with non-skid rubber tips to keep it in place. The height of the seat can be quickly adjusted from 16 to 21 inches. Assembly is not a problem because it can be set up in few minutes without tools. Seat size is 15.75 inches wide by 13 inches deep. This seat is ideal for people who weigh 275 pounds or less. It makes bathing for people with mobility problems much easier. If you or someone you know is having difficulty in bathing, this chair will be useful. It comes with a backrest for added comfort. This seat can accommodate up to 325 pounds and has drainage holes to avoid slippage. The frame is made of anti-corrosive aluminum and requires no tools to assemble. Seat to floor height is 15.5 inches and is fully adjustable. Suction tips are installed for added stability. While users can comfortably sit in this 14.5 inches deep by 20 inches wide device, it should be noted that it has no armrests. This shower aid is a pretty good buy with many reviewers reporting satisfaction with its effectiveness. Features include removable padded arms that provide comfort and safety, texturized seat to avoid slipping, and an aluminum rust-free frame. The arm can be removed while the backrest can be adjusted backwards. This product only weighs 5 pounds and can be lifted easily by its user. Although lightweight, it is durable and sturdy. However, it has a weight limit of 300 pounds. Depending on how tall the user is, the height of the legs can be adjusted from 16 to 20 inches. Bathing will be more convenient even for people with mobility problems with the help of this shower chair. This product comes with a back and armrests, allowing for safe and comfortable movement. The durable aluminum frame is resistant to rust and comes with suction tips to keep it firmly in place. The seat measures 15.75 by 13 inches and it has 12 drainage holes. 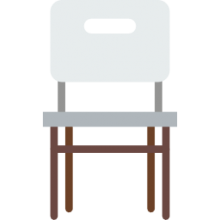 The height of the chair can be adjusted from 16.25 to 21.25 inches. However, its weight capacity is only up to 220 pounds which is lower than most shower chairs in the market. Customers appreciate the easy and tool-free assembly of these medical shower aids. Most users found that shower chairs could accommodate a range of different bathroom showers, from stalls to wider tubs. Sometimes water can collect in the chair’s recesses, so if the chair is going to be sitting unused for some time it is best to empty or dry out the water. 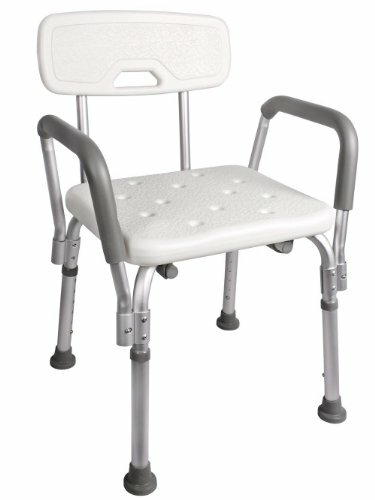 Customers reported using this chair for conditions like multiple sclerosis, arthritis, ruptured discs, fractured hips, degenerative disc disorder and for seniors with generally limited mobility. Generally the rubber feet have drain holes so water does not collect in them. Customers also appreciated the stability the rubber feet provide on the slippery shower and tub surfaces. If you are especially heavy, and carry a large amount of weight in your midsection, you might be best served to use a bariatric shower chair. Many shower chairs feature ‘quick release’ arms and backs, making it easy to disassemble and transport. Adjustable height legs enable the shower chairs to be used by individuals of a wide range of heights. If you have an unusually small shower stall or narrow bathtub, you may want to be extra careful with the shower chair you purchase. Take some measurements of your bathing area and then examine the product specifications on Amazon.com to ensure that you select a shower chair that is a good fit. Customers also liked that the handles of the shower chair were useful in helping them to get in and out of the shower. It’s also important when you are purchasing a shower aid to examine the warrantee details prior to purchase. In the event that you have to return the item or exchange it, it’s good to know that the warrantee of the item you have purchased covers returns and exchanges. Because the bathroom features so many slippery and hard surfaces, it is certainly one of the more dangerous areas of your home. The Centers for Disease Control and Prevention reported that around 234,000 nonfatal bathroom injuries took place in the United States in 2008. The following some general advice concerning how to make your bathroom more safe. Get rid of the rugs. Throw rugs can actually make the floor even more slippery and are reported to be the number one reason for household falls. If you really like your throw rug, you can try to secure it with tape or with some tacks. Try installing grab bars and rails in the area of your bathtub, toilet and shower. These are useful to help individuals balance when they are sitting and standing, allowing them to grab onto something in the event that they are slipping. Clean your bathing area routinely, because mold that may grow can create extra slippery surfaces. Low toilet seats can also be somewhat hazardous. 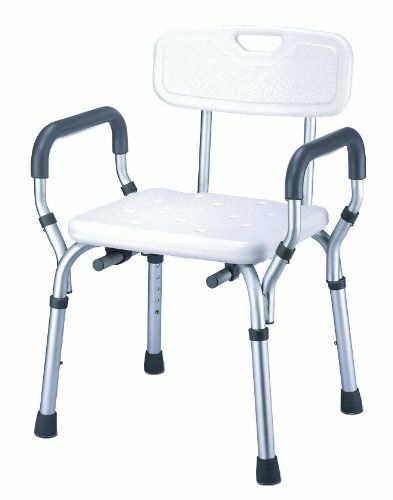 Consider purchasing a toilet seat raiser so that you do not have to squat so low to the ground and potentially injure yourself when using the toilet. Also consider using a handheld showerhead. This way you will not have to rotate while standing in the shower, minimizing the possibility of slips and falls. Another common sense recommendation is to take your time in the shower. Don’t rush yourself, it is better to take a longer shower and risk a higher water bill than rush through your bath and potentially slip and fall. Install a weighted shower curtain. This will help to ensure that water does not leave the bathing area and make the floor hazardously slippery. If you are in the market for a shower assistance device, consider purchasing one of the shower chairs that we have reviewed in this post. The manufacturers of these shower assistance products have tested them extensively to ensure that they are safe and secure for you or for a loved one. If you need extra information, we would recommend heading over to Amazon and checking out the reviews as well as the question and answer section of the shower chair product page. Consumers there have left a great deal of feedback about how they use these shower aids for the elderly or the disabled. We hope that you are able to use new the information we provided here to select a great product for you or your loved one.